Todd and Gary breaking into the bike yard and being chased by a guard dog. 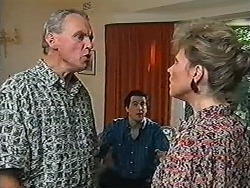 Beverly is worried as Todd isn't in his bedroom, Ewan tells her not to worry but Beverly thinks he might have run away. 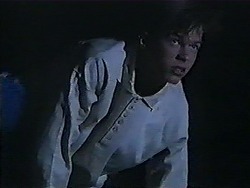 Todd then comes in and Beverly shouts at him telling him he is meant to be grounded. Beverly tells him not to go out without permission again; Todd says he doesn't want to discuss private things in front of Ewan. Ewan consoles Beverly and then leaves; Beverly thinks maybe Todd should go back to living with his mother. Dorothy is at the door telling Helen she is an “island of sanity”. Dorothy says she wants to speak to Helen who is currently drawing Derek Wilcox's old house, she has photos of it. Dorothy is worried about Ryan and tells her about the superglue incident at school. Dorothy asks Helen what she should do, Helen tells her to have a “heart to heart” with Ryan who is now at football practice. Helen wants to carry on sketching so Dorothy goes to make tea, Helen doesn't say where Jim is when Dorothy asks. Beverly is sitting on the patio at a table, the Counsellor brings out drinks. Jim is sat on a railing. 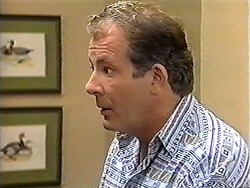 The counsellor wants to discuss jealousy and asks Jim for an example; Jim explains about Cairns when Beverly went away. Beverly said Ewan wasn't going with her but Jim found out that he did go, Jim went to Cairns to confront them but it turns out Ewan wasn't there after all! Jim says he felt stupid and thought that Beverly was having an affair; Jim says he always feels jealous but he also says Beverly hasn't done anything to make him feel jealous. 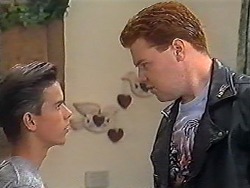 Gary tells Todd that he needs to be quicker next time; he also wants Todd to give him an alibi. 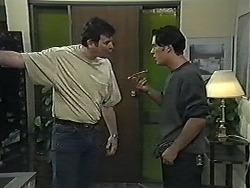 Todd says he can't because Beverly knows he was out, Gary tells him to as Josh in a threatening manner. The counsellor asks what Jim's grievances are, he says that Beverly's career is more important than her family citing her forgetting Todd's birthday present as an example. Beverly says it was a one-off and that Jim keeps bringing it up, Jim tells her that she didn't know where Todd was last night. Beverly says her career has always been important and Jims has become less important. JIM: My priorities have always been the same. Beverly says maybe Jim has slowed down as he gets older. JIM: At my stage of life! You're talking like I'm some boring old has-been! BEVERLY: Yes Jim, you've become a boring stick in the mud! 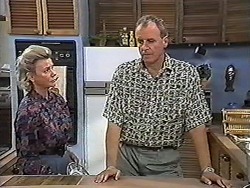 The counsellor tries to calm them down but fails, Jim says Todd is neglected and that it's a good job him and Beverly never had children, Beverly storms off as does Jim. Matt is listening to loud music as Des and Paul come in. They want to watch the football as Chrissie won't let them watch it at Paul's house. Des tells Matt to watch the loud music, his eardrums might burst! The boys then shout at the TV! JOSH: We went there later. BEVERLY: So you were both there later? JOSH: Yes, but I couldn't be certain of the time. BEVERLY: Well isn't that funny because Jim says you weren't there at all. Josh is flummoxed and admits he wasn't with Todd. Beverly leaves and Josh looks concerned. Dorothy and Helen have finished their tea, Helen wonders where Jim is. Dorothy asks about Derek. DOROTHY: Is he rich or poor? What's wrong with him? HELEN: There's certain questions you don't ask when you've just met someone. Jim then returns from counselling but says nothing; Dorothy takes the hint and leaves. Helen wants to know where Jim has been, he went driving, he tells Helen about the counselling session but it's very one sided, he talks about her neglecting Todd and her accusations about his lack of career. Helen goes to make lunch; she thinks it's good that things are out in the open. Jim says there will be no more counselling. Matt brings in pizza but he leaves the front door open and Des becomes angry because Jamie could have escaped from the house. The argument carries on; Matt says Des should leave him alone and stop telling him what to do. DES: Matt, house rules are house rules. Matt tells Des he can have any rules he wants as he's moving out tomorrow! Paul is speaking to Matt and playing peacemaker, Des says he was too heavy handed and apologises. He says he is uptight because Matt has just moved in. DES: Fair dinkum, I like you living here, it's a nice balance, Melanie is crazy and you're sensible! They become friends again and they settle down for pizzas. Beverly tells Helen that the counselling session was a disaster and she wants to apologise to Jim. She thinks they should work together to help Todd and it might help their marriage as well. Jim's already left for the day and Beverly is a bit deflated and decides to head for the workshop. Helen explains that Jim isn't here; he's gone to New York! It seems Jim didn't tell Beverly and she is not happy. BEVERLY: What's he going to do over there? Throw himself off the Brooklyn Bridge? Helen explains that Rosemary asked him but Jim said no because of the counselling but he changed his mind. Beverly is still not happy, Helen says she has Jim's phone number but Beverly says Jim couldn't care less and leaves the house in a huff. Todd is sat down and Gary approaches, he wants Todd to wag school but Todd says Beverly is watching him far too closely for that. Gary pushes Todd further but he still says no. Josh, Cody and Melissa arrive at another table, Josh tells Todd that they lost the game on Saturday because Todd wasn't there, Todd apologises but Josh is unforgiving. He talks to Melissa who says that she is still banned from seeing him. Todd offers to talk to her parents but Melissa says that they are serious about the ban. Josh tells Todd about Beverly asking him where they were the other night, Todd says he got a lecture about it but is evasive when they ask where he actually was. 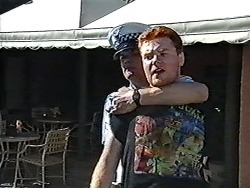 A police officer approaches Gary, they have found stolen parts in his house, he tries to run away but another policeman grabs him. Gary claims his innocence as he's led away, Todd looks worried. Ewan arrives and tells her he's moving to Perth, he says there's also a job for her! He then declares his love, says Jim isn't right for her and that her and Jim are over. Beverly looks shocked.